The plane was barred from Guyanese airspace after authorities discovered that its crew had been allowing dangerous overloading of luggage on flights. 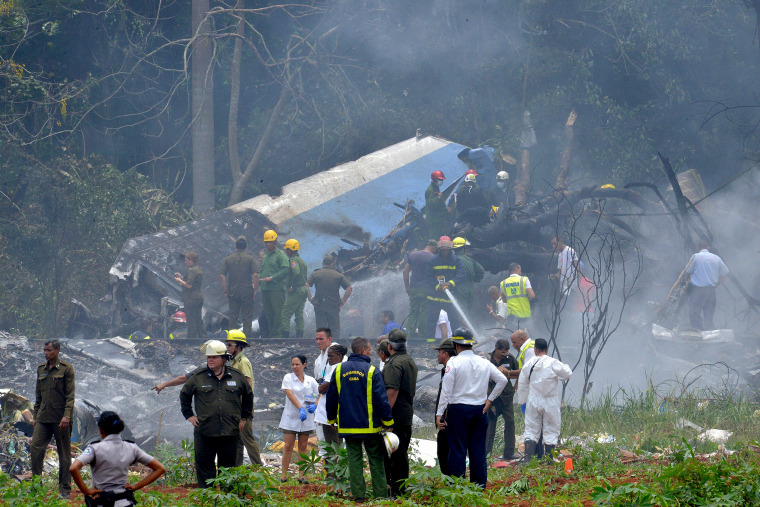 HAVANA — The Mexican charter company whose 39-year-old plane crashed in Havana had been the subject of two serious complaints about its crews' performance over the last decade, according to authorities in Guyana and a retired pilot for Cuba's national airline. Mexico's government said late Saturday that its National Civil Aviation Authority will carry out an operational audit of Damojh airlines to see if its "current operating conditions continue meeting regulations" and to help collect information for the investigation into Friday's crash in Cuba that left 110 dead. Twenty evangelical priests were among the dead, according to Maite Quesada, a member the Cuban Council of Churches. Yzquierdo also said the jet's "black box" voice recorder had been recovered and that Cuban officials had granted a U.S. request for investigators from Boeing to travel to the island. Yzquierdo confirmed to NBC News that Boeing has been allowed to join the investigation into the plane crash.